My Philosophy is simple, choose the best whole foods that you can afford. The problems comes with no one agrees on the best way or best types of foods to actually feed our pets. Even in if the human world we are always changing what is good for us. It is generally accepted that real, whole, foods is best and processed foods are bad. That is true for humans and animals. Some say dogs are carnivores, others omnivores and a few will say you can feed dogs and cats a vegan diet. So what should we do? Personally I believe dogs are Facultative Carnivores. But what does that mean? A facultative carnivore does best on a carnivorous diet, but can survive, not thrive on a non-carnivorous one. To take this to the next level, I do believe dogs are scavengers and can eat many things and do on a regular basis. But in real life you could not put your dog in a garden and allow her to only eat the fruits and vegetables and expect her to survive for long. Yet you could with an omnivore. Dogs can simply not digest fruits and vegetables without help. In the wild they would eat the stomach contents of their prey, getting the required nutrients from the pre-digested stomach contacts, or they could eat rotten fruit or vegetables of the ground, again pre-digested or we can cut, grind, juice or cook the fruits and vegetable that they need. Others believe dogs are Obligate Carnivores (true carnivore) (cats definitely are) and I am ok with that thought as well. The problem here is it almost impossible for us to duplicate a prey diet. Some feel feeding meat and bones will replicate a prey diet but it is not even close. In the wild when a dog would catch it’s dinner she would eat everything, the muscle meat, offal (organ meats), stomach, lungs, brain, bone, eyes, fur, hooves and whatever else is available. Some will try to create a prey diet by raising livestock, like rabbits, turkeys, chickens and the like. But again this only partially replicates a prey diet. A wild animal is eating naturally, no processed foods, exercising (to stay alive) to the point a wild animal has limited fat. A domesticated raised rabbit or turkey can have well over 20% body fat, were a wild animal may only have 2 – 4% body fat. Finally to match a prey diet you would have to allow your dog to run wild in the fields and woods. I am a believer in Zoopharmacognosy in animals. Wild animals can self-medicate by ingesting or rubbing plant material (herbs) to self treat. Just think of your dog eating grass to calm an upset stomach, even making themself vomit if needed. So where does that leave us. We can either create a home based diet (either cooked or raw) or choose a commercial diet, Dry, canned, dehydrated, premade raw or prescription diets. 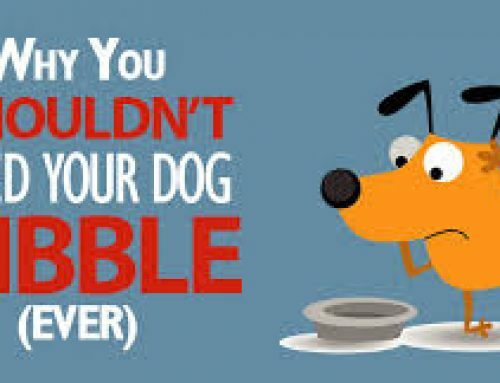 Read why kibble (any dry food) is bad for your dog and even worse for your cat. I would be happy to help you choose a commercial food and show you how you can make it better or to create a home based diet. I am flexible in how you decide to create a diet. Either scientifically going through every ingredient, ensuring it meets the AAFCO requirements, or through multiple different types of meals. As long as it is balanced that is all that matters. Again I believe in a whole food diet as the best (if it is balanced) and kibble (dry food) the worst with canned better than dry, human grade better than pet feed with the others feeding options mixed somewhere in between. It is not that hard to create a diet for your dog. For more information please feel free to contact me anytime.